Reverend T Fry is shown in profile facing to the left. He wears a minister's coat and shirt and is bareheaded. 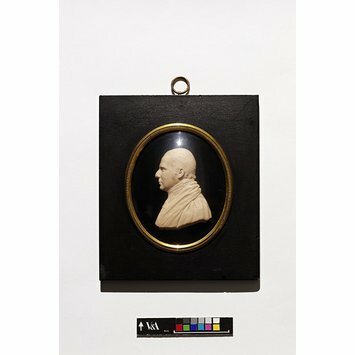 During the eighteenth and nineteenth centuries, low relief portraits in wax became popular in Britain and they were often exhibited at the Royal Academy, the Society of Artists and elsewhere. 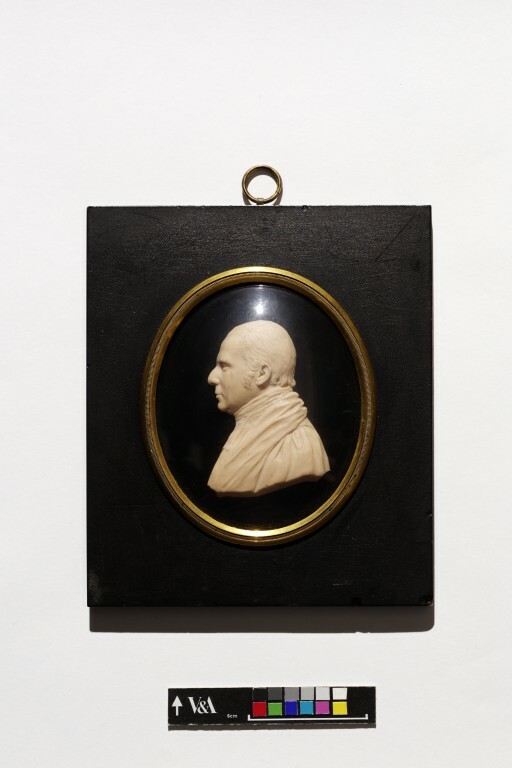 Waxes were used in a similar way to prints and medals, in order to disseminate the image of the sitter, or, like miniature paintings or silhouettes as portable mementoes. The profile relief, in cream wax on black glass is shown facing to the left. He wears a minister's coat and shirt and his head is bareheaded. '[Head?] of the Rev T Fry [the name has been stuck on] / Modelled by Miss Covell / G E Woodhouse / Jan 27 1810'. Reads a handwritten label on the back. From the Mary Bate Collection, ex. loan 72. Bought from Philip Bate for £100. Pyke, E.J. A Biographical Dictionary of Wax Modellers, Oxford, 1973, p. 32.